Ambassador supports a highly flexible mechanism for authentication. An AuthService manifest configures Ambassador to use an external service to check authentication and authorization for incoming requests. Each incoming request is authenticated before routing to its destination. AuthService V1, introduced in Ambassador 0.50, allows you to separately configure the headers that will be sent from the client to the auth service, and from the auth service to the upstream service. It also allows sending body data to the auth service. You should use AuthService V1 for any new deployment of Ambassador 0.50 or higher. proto (optional) specifies the protocol to use when communicating with the auth service. Valid options are http (default) or grpc. if false, the message is rejected. allow_request_body is deprecated. It is exactly equivalent to include_body with max_bytes 4096 and allow_partial true. AuthService V0 was current prior to Ambassador 0.50.0. It is deprecated and support for V0 will be removed in a future Ambassador release. allowed_headers (optional) gives an array of headers that will be incorporated into the upstream request if the auth service supplies them. You may use multiple AuthService manifests to round-robin authentication requests among multiple services. Note well that all services must use the same path_prefix and header definitions; if you try to have different values, you'll see an error in the diagnostics service, telling you which value is being used. Supporting traditional SSO authentication protocols, e.g., OAuth, OpenID Connect, etc. You can tell Ambassador to use TLS to talk to your service by using an auth_service with an https:// prefix. However, you may also provide a tls attribute: if tls is present and true, Ambassador will originate TLS even if the service does not have the https:// prefix. If tls is present with a value that is not true, the value is assumed to be the name of a defined TLS context, which will determine the certificate presented to the upstream service. TLS context handling is a beta feature of Ambassador at present; please contact us on Slack if you need to specify TLS origination certificates. 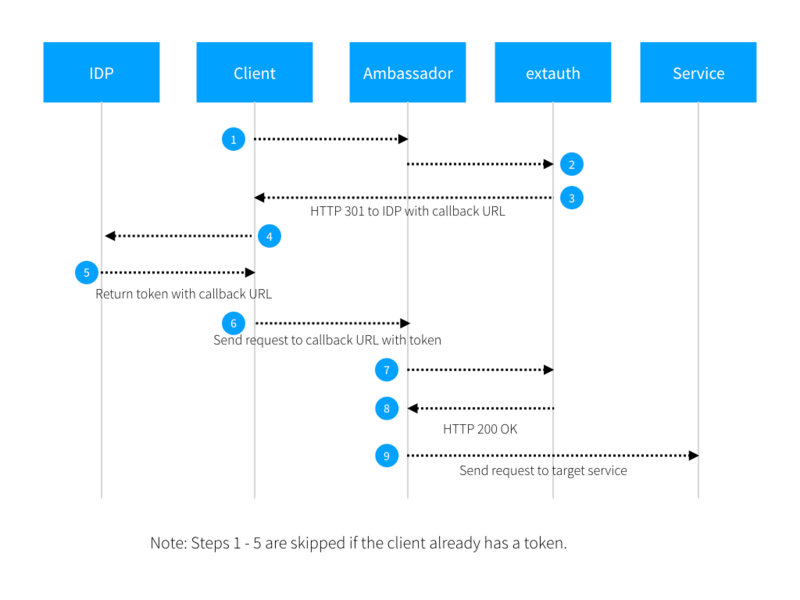 The external auth service receives information about every request through Ambassador, and must indicate whether the request is to be allowed, or not. If not, the external auth service provides the response which is to be handed back to the client. The control flow for Authentication is shown below. The Content-Length header is overwritten with 0. ALL request methods will be proxied, which implies that the auth service must be able to handle any request that any client could make. If desired, Ambassador can add a prefix to the path before forwarding it to the auth service; see the example below. To tell Ambassador that the request should be allowed, the external auth service must return an HTTP status of 200. Note well that only 200 indicates success; other 2yz status codes will prevent the request from continuing, as below. The 200 response should not contain any body, but may contain arbitrary headers. Any header present in the response that is also listed in the allow_headers attribute of the AuthService resource will be copied from the external auth response into the request going upstream. This allows the external auth service to inject tokens or other information into the request, or to modify headers coming from the client. Any HTTP status code other than 200 from the external auth service tells Ambassador not to allow the request to continue. In this case, the entire response from the external auth service - including the status code, the headers, and the body - is handed back to the client verbatim. This gives the external auth service complete control over the entire response presented to the client. The external auth service can simply return an error page with an HTTP 401 response. The external auth service can choose to include a WWW-Authenticate header in the 401 response, to ask the client to perform HTTP Basic Auth. The external auth service can issue a 301 Redirect to divert the client into an OAuth or OIDC authentication sequence. Finally, if Ambassador cannot reach the auth service at all, it will return a HTTP 503 status code to the client. Authentication can be disabled for a mapping by setting bypass_auth to true. This will tell Ambassador to allow all requests for that mapping through without interacting with the external auth service. See the Ambassador Authentication Tutorial for an example.